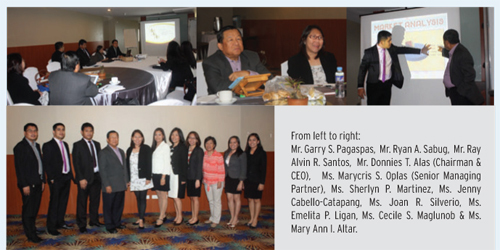 Headed by our Chairman & CEO, Mr. Donnies T. Alas and Senior Managing Partner, Ms. Marycris Oplas the Strategic Planning with Managers and Partners last August 16-17, 2013 at Summer Ridge Hotel, Tagaytay City. Two day event that highlights company’s strategy, towards making decisions for the direction of the organization. This has been attended by Partners: Ms. Emelita Ligan, Mr. Garry Pagaspas and Mr. Ryan Sabug with Managers: Mr. Alvin Santos and Ms. Cecile Maglunob. Together with Ms. Jenny Cabello- Catapang, Ms. Sherlyn Martinez, Ms. Joan Silverio and Ms. Mary Ann Altar who witnessed creative minds of the firm with their respective Right Brain Presentation. This activity defines awareness with the needs of the employees to the Management and Management to the employees. It is the way of saying, “You lay down your cards and so do I”. Trainings for the employees of the alliance and Auditors has been conducted and succeeding seminars will took place for continuous learning for the firms gradual development.